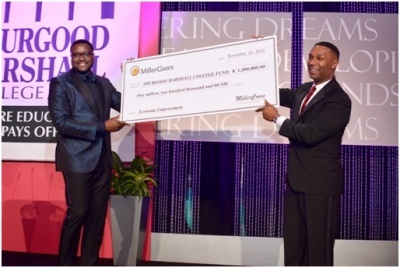 (BPRW) MillerCoors Renews Commitment to Thurgood Marshall College Fund With a Milestone $1.2 Million Donation | Press releases | Black PR Wire, Inc.
(Black PR Wire) WASHINGTON, DC – MillerCoors, founding corporate sponsor of the Thurgood Marshall College Fund, recently presented the organization with a $1.2 million donation to support its programming and scholarships during TMCF’s 27th Anniversary Awards Gala on Monday at the Hilton Washington, DC. The funding will support their Teacher Quality and Retention program; as well as a number of students will receive a scholarship. MillerCoors also provides real-world experience for program scholars through its summer internship program, career readiness counseling and on-site student interviews during its annual career fairs. Furthermore, MillerCoors actively recruits students for employment opportunities. For more information please visit www.millercoors.com. Through its diverse collection of storied breweries, MillerCoors brings American beer drinkers an unmatched selection of the highest quality beers steeped in centuries of brewing heritage. Miller Brewing Company and Coors Brewing Company offer domestic favorites such as Coors Light, Miller Lite, Miller High Life and Coors Banquet. Tenth and Blake Beer Company, our craft and import division, offers beers such as Leinenkugel’s Summer Shandy from sixth-generation Jacob Leinenkugel Brewing Company and Blue Moon Belgian White from modern craft pioneer Blue Moon Brewing Company, which celebrates its 20th Anniversary this year. Tenth and Blake also operates Crispin Cider Company, an artisanal maker of pear and apple ciders using fresh-pressed American juice, and imports world-renowned beers such as Italy’s PeroniNastroAzzurro, the Czech Republic’s Pilsner Urquell and the Netherlands’ Grolsch. MillerCoors also offers pioneering new brands such as the Redd’s Apple and Redd’s Wicked Apple franchises and Smith & Forge Hard Cider. MillerCoors seeks to become America’s best beer company through an uncompromising promise of quality, a keen focus on innovation and a deep commitment to sustainability. MillerCoors is a joint venture of SABMiller plc and Molson Coors Brewing Company. Learn more at MillerCoors.com, at facebook.com/MillerCoors or on Twitter through @MillerCoors.